Kem Ley, a prominent Cambodian political activist and government critic, has been shot dead in the capital Phnom Penh. He was killed at a petrol station in what police said was a dispute over money. A man has been arrested. 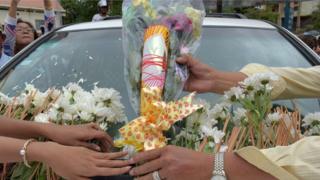 As word of his death spread, thousands of his supporters accompanied a car carrying his body to a local pagoda. It comes at a time of rising tension between the government and opposition ahead of elections expected next year. Kem Ley was involved in grassroots activist groups, criticising the government of Prime Minister Hun Sen.
Cambodia became a multi-party democracy in 1993, but opponents accuse the prime minister of running a violent and authoritarian system. Hun Sen, who heads the Cambodian People's Party (CPP), has led the country for decades. The CPP won disputed general elections in 2013, taking 68 seats compared with 55 for the opposition Cambodia National Rescue Party (CNRP). The CNRP initially boycotted its parliamentary seats but later reached an agreement with the CPP. In July 2014, protests erupted over a government decision to close Freedom Park, leading to violent clashes, and tear gas and batons being deployed.